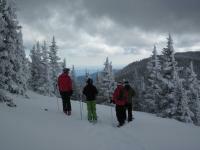 It's mid-winter (north of the equator) and a skier's thoughts will turn to the backcountry. If you've never hiked outside of a ski area, or you want a refresher, here are a few short videos to introduce you to skiing (and snowboarding) out of bounds. 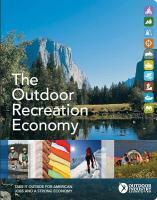 Thanks to Sarah Carpenter and Outdoor Research for posting these how-to videos. While I check my pack and gear I hope the snowpack near you is deeper and more solid than what is in the mountains near me. 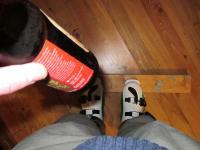 Most modern ski boots feature thermo-fit liners that provide a custom-fit boot for minimal hassle. But, if you buy your boots online or if you're pressed for time how do you get that custom fit without a trip to a ski shop? If you have an oven and properly fitting boot shells, it's easier than baking cookies. Thanks to Charlie for the simple how-to instructions for baking and custom fitting your own thermofit boot liners. 1. Crack open a beer. I'm always a bit rusty at the start of each ski season. Preparation starts in my closet as I swap cycling gear for ski equipment. Bags and bins are dumped to assess the condition of gloves, socks and shells. Skis, boots and poles are checked to see which will serve one more season, get sold at the local ski swap or recycled. I don't buy new gear often, but it's fun to add new boards to the quiver and replace battered boots. 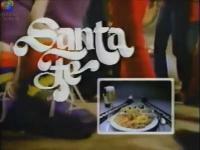 To kick fall off to a stylish start here's a skiing / fashion / music flashback for those of us who were skiing in the 1980's. The only scary thing is that I still see skiers on those same 80's vintage skis and boots! Welcome to Summer all you Northern Hemisphereans (is that a word?)! While winter is half way around the sun for many of us, now is a great time of year for all forms of warm-weather outdoor recreation. If you work in the 'fun' world of outdoor recreation you might feel like some people don't take the outdoor industry very seriously. What if you could tell them that the Outdoor Industry employs nearly three times more people than the fossil fuel industry? It turns out that outdoor fun is serious business. Backcountry, sidecountry, slackcountry. Call it whatever you like, it's skiable terrain that is not managed by a resort or patrol organization. Once you duck a rope, step through a gate or start skinning up a slope you are taking a risk with the snow you will slide down. 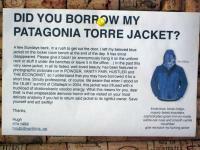 Patagonia doesn't want you to buy their jacket. Well ... only if you've already worn out and recycled the one you already have. I'm already there. Call me frugal, or worse, but I try to buy durable stuff and use it until it's ready for the rag pile. Patagonia has gone one step further and will recycle everything they make. But first, I have a pair of ski pants that need repair.